"In the cave all day, five killed, eleven wounded. A shell went through the dug-outs. Nellie Cowan just left it before; he says "Gee, I'm lucky!" Major Ellis died. 1 Cane, Bruce. It Made You Think of Home: The Haunting Journal of Deward Barnes, CEF. Dundurn Press Ltd., 2004. Headquarters of the Canadian Corps at Neuville-Vitasse, August of 1918. The 19th Battalion was originally formed the 7th of November, 1914 at the Exhibition Park in Toronto, Ontario, Canada. Soon the battalion went from High Park to the shores of England on the USS Scandanavian on the 23rd of May, 1915. They trained in Shorncliffe, Kent at West Sandling camp. By September of that same year the 19th landed in Boulogne, France to begin over 4 years of service on the European continent. During their service, the men of the 19th fought on the Vimy Ridge, in the environs of Transloy- endured Passchendaele, the German offensives "Michael" and "Georgette", Amiens, and many other battles to finally push the German Army into surrendering their arms in November of 1918. During good times, the men often played soccer, had shooting contests, played their instruments, enjoyed church services, and challenged other battalions. During the bad times, they slept in dirty, smelly, infested holes, constantly wore gas protection, marched back and forth from trenches to reserve camps, were bombarded by shells, both gas and not, were exposed to sudden raids by Germans, and even had to shoot their own men who had deserted. We shall never forget those men who did so much for us. To the memory of my great uncle and namesake Emery John Larock (1893-1921), 19th Battalion, A Company. We lost him far too soon to the effects of his service in the World War, officially called pulmonary tuberculosis. 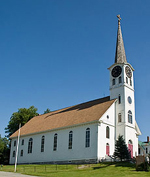 He is buried at the St. Paul's Cemetery in Barton, Vermont with a simple headstone that notes his service in the CEF. Like my uncle Dale, God touched him and he slept.